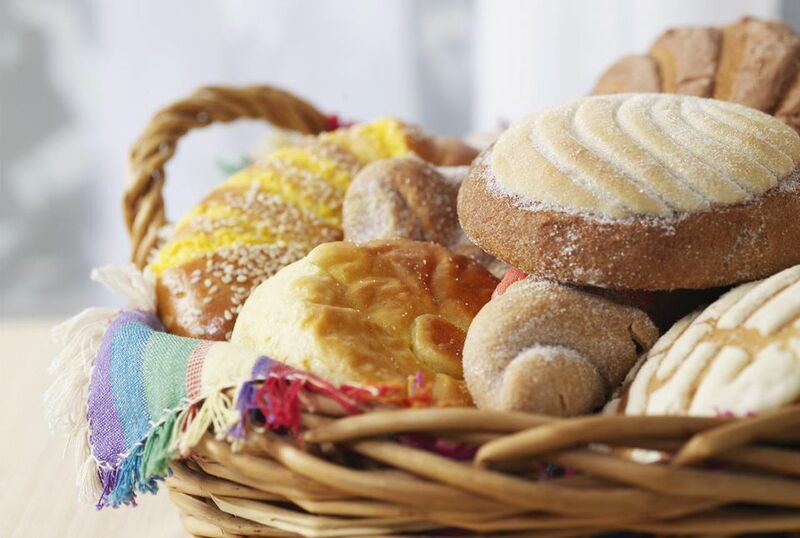 Pan dulce translates as "sweet bread," and in Mexico, you can find hundreds of variations to satisfy nearly any taste preference, from flavors like vanilla, chocolate, or cinnamon to fillings like cream, fruit, or nuts. This recipe for a basic pan dulce results in buns perfect for a sweet snack or light dessert; they taste best the day you bake them, but you can tightly wrap and freeze any leftovers. Mix 1 tablespoon of sugar and the yeast into lukewarm water. Let it rest for about 10 minutes. Cream the shortening and sugar in a large mixing bowl until fluffy. Slowly add the eggs, the salt, and the yeast water to the bowl, mixing to combine. Add the flour 1 cup at a time and mix on low speed until fully incorporated. Cover the dough and let it rise in a warm place for 45 minutes. Divide the dough into 16 pieces and shape each into a ball. Place them on a lightly greased baking sheet with plenty of space in between each one. Press each ball slightly to flatten it. Let the dough balls rise for another hour. During the second rise, mix all of the topping ingredients in a food processor until smooth. Add a few drops of optional food coloring if desired. Use your hands to divide the topping into 16 pieces. Roll each piece into a ball in your palms. Then, use a rolling pin to flatten each one out on a floured surface to about 5 inches in diameter or until it can cover one of the risen buns. Lightly press each topping disc onto an unbaked bun and use a knife to cut a pattern into the topping layer, without cutting into the dough. Bake the buns at 350 F for about 15 minutes or until they turn lightly golden. Cool the buns on a wire rack before serving. You can vary the look of your pan dulce with different topping designs. Keep it simple with a few lines etched into the top, or elaborate with a criss-cross or other pattern. Left alone, the topping produces its cracks, another interesting visual result.